Blago Bloggo's PDB Watch: Dededefeated! Throughout the course of my campaign for Congress, I have made the people of the 23rd District and the issues that affect them the focal point of my campaign. As a life long resident of this District, I care deeply and passionately about its people and our way of life. Whether as a candidate for Congress, a State Assemblyman or the King of Dreamland, I have always sought to act with the best interest of our District and its residents in mind—and today I again seek to act for the good of our community and its delicious fruit. The opportunity to run as the Republican and Royalist Party candidate to represent the 23rd District has been and remains one of the greatest honors of my life. As a member of the penguin minority of this district, I have always had my own challenges from anti-penguin bigots. Yet, during the past several months, as I’ve traveled the district, meeting and talking with voters about the issues that matter most to them, I’ve been overwhelmed by the amount of support I’ve received from open-minded constituents as I sought to serve as their voice in Washington. However, as Winston Churchill once said, Democracy can be a fickle employer, and the road to public office is not always a smooth one. My road to Washington DC has been diverted by a pink puffball, Kirby, who was running as the Free Markets for Fruit Party candidate after failing to receive the Republican Party endorsement. Perhaps the most notorious of his actions followed after my ill-advised decision to hold a press conference in front of Kirby's campaign headquarters, at which I was outshouted by the pink puffball's mindless minions. Shortly after the above photo was taken Kirby clobbered me with a giant hammer and knocked me out of the picture at a velocity of roughly 11,000 mph and a 35 degree angle from the horizontal. My allies, including the Great Newt and Frank Rich of the New Penguin Times, have been very kind, but I am afraid that I cannot defeat Kirby at this time as he has transformed into Metallic Kirby and is now invulnerable. I can clobber him all I want but it doesn't do any good. In recent days polls have indicated I don't have a chance in Dreamland to prevail in this battle with Kirby. 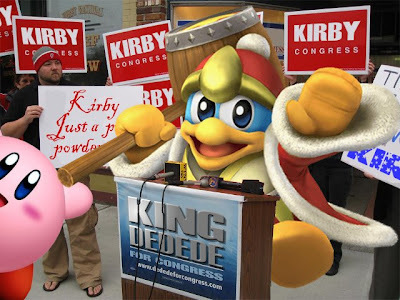 So with a heavy heart and a broken hammer I suspend my campaign and release my supporters to support whoever they want, whether it be the pink puffball whats-his-name or Meta-Knight, the Democrat and Real Evil Party candidate. I, myself, will be voting for Meta-Knight. Just a FYI. What? You don't like penguins??? Clearly PDB Watch is the home of anti-penguin bias and hate speech and the proprietor and associates should be sent to Antarctica for a 13-month reeducation experience. I hear December is nice in the Antarctic if you are a penguin. That pic is so funny...I just soiled my napkin..